Mealycup sage (Salvia farinacea) has stunning purple-blue flowers that attract pollinators and brighten the landscape. The name may not sound terribly pretty, but the plant also goes by the name blue salvia. These salvia plants are warm region perennials but can be used in other zones as attractive annuals. Continue reading for some comprehensive blue salvia information. An adaptable plant, mealycup sage thrives in either full sun or low light situations. The striking flowers are borne on long spikes which stretch half as high as the bushy foliage. Blue salvia is not bothered by deer, drought tolerant once established, and makes lovely cut flowers. 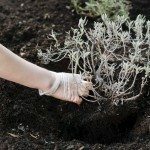 Some tips on how to grow mealycup sage will soon have you enjoying this plant, which is equally at home in the herb or flower garden. The plant’s species name ‘farinacea’ means mealy and comes from the Latin word for flour. This references the silvery dusted appearance of the leaves and stems on farinacea sage. Mealycup sage has small oval- to lance-shaped leaves that are softly furred and silvery on the underside. Each leaf can grow 3 inches long (8 cm.). The clumping plant may grow 4 feet (1.2 m.) tall. Plants bear numerous flowers on terminal spikes. Usually, these are deeply blue but may be more purple, light blue or even white. Once flowers are spent, a small papery capsule is formed that some birds enjoy as food. Blue salvia will provide a color display from spring well into summer. Plants are not hardy and will die back in most zones once fall chill arrives. Propagation through seed is easy, so save some seed in northern climates and plant in spring after all danger of frost has passed. You can also propagate through softwood cuttings taken in spring. Only those gardeners growing mealycup sage in USDA zones 8 to 10 can use the plant as a perennial. In all other zones it is an annual. The plant is native to Mexico, Texas and New Mexico where it grows in meadows, plains and prairies. 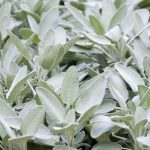 Farincea sage is in the mint family and has a very pungent scent when leaves or stems are damaged. This is a very useful plant in borders, containers, and mass plantings. This elegant wildflower is easy to grow and enjoy. Provide either a full sun or partial shade location with well-draining soil that has been enhanced with compost or other organic amendment. In areas where the plant is a perennial, regular watering is necessary. In cooler zones, provide water at installation and then deep, infrequent watering. Plants become leggy in boggy soil. Deadhead the flower spikes to encourage more blooms. The two primary problems when growing mealycup sage are aphids and powdery mildew. Read more articles about Salvia.